Uncle G's Bed & Biscuit | We love your Pets! 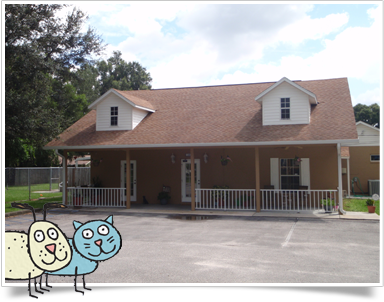 Welcome to Uncle G’s Bed and Biscuit, the premier pet boarding and grooming facility in the Brandon area. All furry friends are invited to relax in any of our kitty condos and dog runs. Feline Friends, enjoy our secluded condos built with your comfort in mind. Canine Companions, frolic in our extensive outdoor play area. Monday through Friday: 8 am - 6 pm and Saturday: 8 am to 2 pm. For a full list of our amenities, head to the Pet Boarding page. Just coming in for a spa day? Receive individual attention from our professional grooming team. Try our soothing tea tree shampoo or oatmeal bath for itchy skin. We also have various shampoos of all scents to satisfy. Find pricing and a list of our services on the Pet Grooming page. As always, hug and kisses are complimentary with any part of your stay. Still not sure if we’re the best fit for you? No need to schedule a time for a tour, come by anytime after 10 am, Monday through Saturday. Call (813) 689-6725 to reserve or click here to contact us! When the owners are away, the pets will play! Join the family at Uncle G’s Bed and Biscuit and enjoy the fun activities at your disposal. Our grooming team, has over 18 years of experience in the pet grooming field. You can rest assured that your pet will return spiffy and relaxed! Make an appointment today! 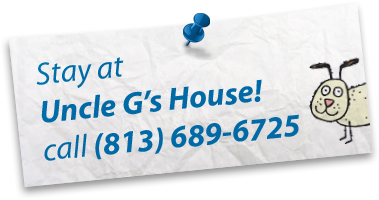 Reserve your room and be part of the family at Uncle G’s Bed and Biscuit.